Organized by Rotary Cambridge, in collaboration with KidsAbility and Run Waterloo, the Rotary Classic Superhero Run is in its 33rd year and has raised 1.2 million dollars to date. Be a part a great day with family, dress like a superhero (if you like) , AND help us to raise money for our community all while having a super time! 1. You will need a Race Roster account to register. If you don't have one already, it's simple and free. Just click "register" to begin. 2. Raise or Donate $50 for KidsAbilitly and get Free Entry! Print this form to collect donations offline. Don't forget to bring the form and all donations to the kit pickup before the race! We would love to waive your registration fee and have you raise money for KidsAbility. If you plan to raise $50 or more, register here! Note: if you do not meet the pledge requirement above, all registration fees will apply. Individual. Price includes tax AND processing fees. Event starts at 10:30. 1k registrations do not include a t-shirt. Price includes tax AND processing fees. Untimed. 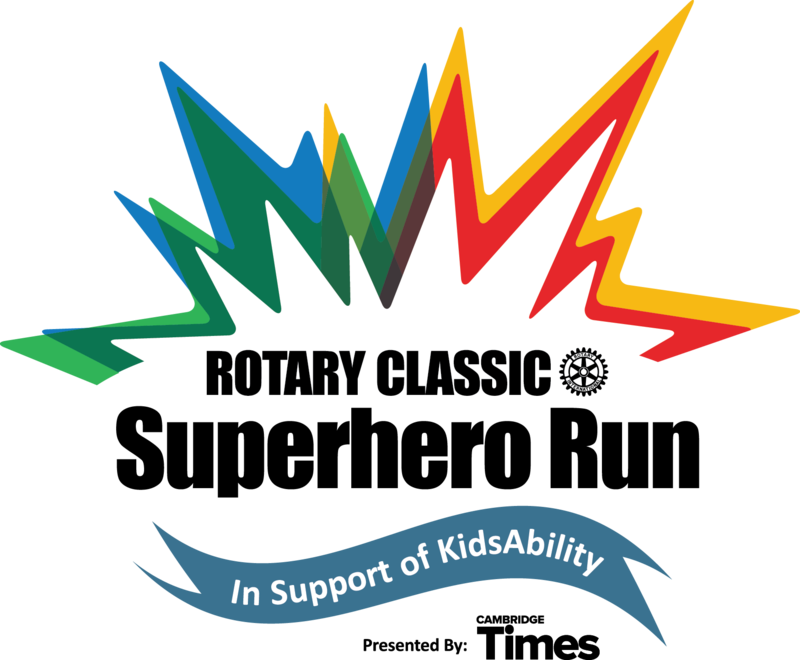 The three Rotary Clubs of Cambridge together with the Cambridge Times, and the Waterloo Region Police Service invites runners, joggers and walkers to make a difference for children with special needs. Join us on Sunday, June 2, 2019 at Hespeler Memorial Arena in Cambridge for this family-friendly event. Your support will help to make a difference for the nearly 2,000 children and youth with special needs who benefit from life-changing therapy and support services at KidsAbility in Cambridge. We encourage you to collect donations from your colleagues, friends and family. Set your fundraising goal so your supporters can watch your progress and help you reach your goal. After the race, the top three teams will, in order, have their choice of one of the following prize packages! Hamilton Theatre Matinee or Evening Performance and 3 Course Dinner at the Cambridge Mill for 6. Tickets to Cambridge Ribfest for 10. Bowling and Pizza Party for 12. All entries are non-refundable, non-transferable, and non-deferrable. There are no exceptions once a person has registered. If you pay for the race and choose to fundraise, your entry fee will be counted as a personal donation. Drop off: At Runners’ Choice, 55 Erb St E, Waterloo, by Tuesday, May 28 at 5:00 pm. Online: Right here at www.RaceRoster.com by Friday, May 31 at 12:00 pm. After these dates, entries will only be accepted at Kit Pickup. 2.5 KM and 5 KM Races start at Hespeler Memorial Arena, Cambridge at 9:30 a.m.
All participants receive a finisher gift. Prizes to be announced shortly. Everyone in a superhero costume is invited to a special group photo at the start line at 9:20am (10 minutes before the race start). As far as we know, this photo will be the largest gathering of superheros in Waterloo Region, and this photo will be published in the Cambridge Times. Get inspired, and get creative! Following your run, enjoy a free lunch while you meet some of your favourite superheros. Enjoy the Erick Traplin show, bouncy castle, face painting, and more! Only the first 400 entrants for the 2.5 KM/5 KM will receive a free t-shirt. Deadline for t-shirt is May 25 at midnight. All participants (including 1 KM) have the option to purchase an additional shirt for $15 through the registration process. Use this guide to help with sizing. Stay tuned for the t-shirt design reveal! The sponsors recognized on this page have generously contributed financial support, products and/or services to the Rotary Classic Superhero Run and we encourage your ongoing support of these generous companies and organizations. Join this great group and help us reach our goal! Contact us today! At Results.RunWaterloo.com, race results will be available immediately after the race. Later that week, thousands of race photos - all free to download, will be available from our Flickr gallery and tagged directly to the results!